Many training departments are struggling with topics like information retention, engagement, and employee interest when it comes to their investment in training. 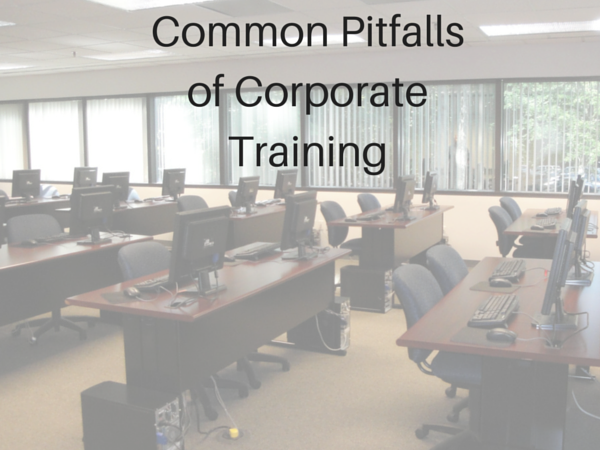 In this post, we’ll look at some of the common pitfalls of corporate training and suggest some simple ways to address these stumbling blocks. Pitfall: Corporate training that doesn’t offer realistic, situationally relevant training misses out on valuable teaching moments that allow students to see theory put into practice. Training that only explains a concept—and never really shows how it relates to an employee’s work—often means only a surface level awareness of the idea on the learner’s end. Example: Scenarios are a great way to accomplish this. Not only can a story-driven scenario be immersive, but it can be the best way to create relevance for the learner. If learners can’t relate to what’s being presented, they won’t make the connections you need them to. By putting them in the middle of realistic emotional situations they could encounter within their jobs, you’re preparing them for the challenges that will be presented to them. The pitfall: If the training session is being administered in any technology-oriented format, a missing moderator can be disastrous. There’s no one to help with technical issues, no one to help troubleshoot on the user end, and no one to reach out to with relevant questions. With no overseer to address these questions, you might end up with a trainee who misses the training completely because he or she spent the whole session waiting for a computer to work properly. The fix: Regardless of format, there always should be an administrator who can help address these issues. Humans are humans, and computers are computers. Both are going to run into situations in which they could use a helping hand. Example: Depending on your organization and where your technical expertise resides, this could be someone like one of your eLearning developers, your LMS administrator, IT staff, or a combination of people. Make sure roles are defined and learners know where to turn when they have issues. The pitfall: The company is using outdated material and resources that are no longer relevant (or interesting) for the learners. Ever been shown a corporate training video that’s clearly outdated? It almost becomes comedy hour. Outdated material is distracting—and it shows your organization isn’t interested in providing current information for employees. The fix: Training should be re-evaluated on at least an annual basis. With as quickly as our modern world changes, there may be old information or old techniques that need to be updated so that learners are trained to the best of their abilities. Plus, one of the benefits of the eLearning format is the ease of updating without having to re-print hard copy materials. If new information conflicts with the old information people had, doing short “Now vs. Then” updates can be helpful in driving home these differences. The pitfall: Some research suggests that as much as 90% of information from training is lost within a year. Without ongoing education efforts, one-off trainings might be a complete waste of time. The human mind needs refresher courses to stay agile and to help the information stick. The fix: Throughout the year, make time for trainees to go back over the material you’ve taught them to be sure they understand and remember different concepts. Or, if it’s an option, make the training materials available for learners to access on demand when they need to brush up on a certain topic. Example: Consider adding a performance support perspective to your training. With short modules geared toward specific tasks, on demand access can be a great supplement to structured training. Other options include leveraging an LMS to send out periodic challenges as follow-ups to training courses. Let your learners re-visit and apply what they learned in fun challenges that put their skills to the test. This keeps important concepts top of mind and reinforces what you deem as the most crucial skills. If you can avoid these common pitfalls, your trainees will better retain information and be more efficiently trained. And when you show that you’re invested in your employees enough to get them the information they need, they’ll feel more valued in return. Sign up for the ThinkingKap e-newsletter.